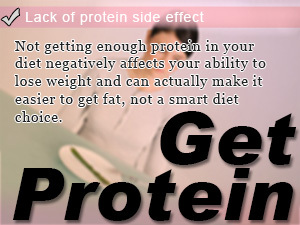 The major reason why people fail in their diets is due to the lack of protein in their diet. Know protein calories to eat right always making the healthy choice. What happens to your body when you lack protein? When you are on a diet to lose weight, it's almost impossible not to worry about how much your calorie intake is and no matter how much you want to eat meat all you can do is resist in a sigh being held back by low calorie red tape. Surely, this is not going to lead to stress and binge eating, isn't it? EATING MEAT = HIGH CALORIES? People often associate eating meat with consuming high calorie meals. Calories are not everything that matters when you are dieting and trying to eat healthy for weight loss. In fact, not getting enough protein in your diet only sets you up to gain weight impairing your ability to lose weight altogether. In this walk in Slism, we will discuss the side effects of lack of protein in your diet going into depth why getting enough protein in your diet is so indispensable to losing weight and present calories in three different sources of protein: beef; pork; and chicken, ending with cooking tips to reduce calories in preparing protein rich foods. Eating meat makes you fat? Although eating fatty meat has long been thought as the enemy to dieting, lean meat is an excellent source of high quality protein essential for a healthy diet. I say meat, but what I really mean is meat plus fat. In that respect, the fat content of the meat you eat depends on the place where it is taken from making a huge difference in calorie consumption. It is caused by the fat contained in meat that there is an image called a high calorie in meat. Though it is a low-calorie, low-fat meat is the best food diet rich in protein. Meat is not the enemy of the diet in any way. It is important to choose a diet that is suitable for meat. What Happens When You Lack Protein In Your Diet? In dieting high protein low fat meals are preferred. What does this mean in terms of your diet? Well, getting enough low calories helps keep your calorie intake down reducing the chance that calories remain that unfortunately get stored away as fat in your body. So, Why is better to intake of protein is good. What are the impact and the lack of? 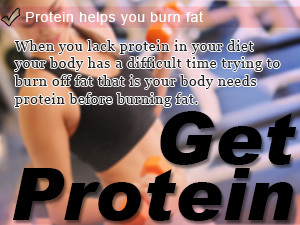 It's Impossible To Burn Fat When Your Body Lacks Of Protein! Protein is an essential component to construct the body. It is one of the three major nutrients as well as muscle and bone, constitute any part of the body, such as skin and hair hormones. Since muscles are made by proteins muscle mass will decrease once you run out. Muscle is essential to fat burning; fat burning is not possible if there is no muscle. That is, shortage of protein will bring down not only the down of the amount of muscles but the efficiency of fat combustion. Slack or saggy skin is caused by lack of muscle. The toned body that is required muscle better. It is not unusual if weight should still be decreasing, have flabby, skinny does not feel. This is such a failure story. It is due to the fact that due to excessive dietary restrictions, the lack of protein, muscle has fallen. It is not because fat of decreased, weight decreased and muscles only fell. Even if it becomes the weight as an image, it does not become the body with the contrast as an image. Diet, but also anxious body weight is fat you want to lose. Lead to a lack of muscle, protein deficiency, it is causing the sagging. Think that a diet, that we need protein. However, it is not it is still worrisome calorie of meat. Let's check the calories of chicken, pork, beef, and mutton. Beef and pork with a fat, chicken skin is with a high-calorie. Things that can be removed, you can reduce the calories by removing. If it is beef and pork and is a fillet and chicken, white meat and breast (skinless) are recommended during a diet. Can also use the meat low in fat, depending on the recipe; it becomes a high-calorie. 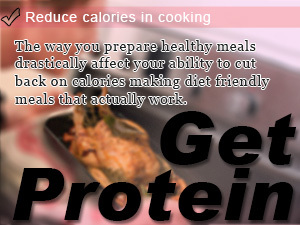 There are cooking methods to reduce the calories so you can further reduce the calorie of meat. If you bake the meat in a frying pan, you will get only high in calories but minus the oil. Salad oil, olive oil, it is also in 111kcal 1 tablespoon (15ml) both. The recommended this is where how to bake without playing the oil in a frying pan nonstick. Nonstick pan is hard to boil dry, fat will appear from the meat; you can cook up without the calories. When cooking in the oven or grill, so fat falls, you do not have to consume extra fat. Boiled, steamed, broiled some cases, because the fat come out, you can avoid the extra calories. However, if you want to ingest juice or boiled broth, so we try to get rid of the fat and scum. Muscle mass is reduced, basal metabolism drops, It will cause the rebound. And dropped the muscle is able to maintain a body weight that is difficult to cut down. Order to create a sharp body muscles try consuming enough meat getting enough protein in your diet. Thinking about converting to vegetarianism? That’s all fine and dandy but what you need to know for is how knowing animal protein vs plant protein works. Not getting enough protein in your diet negatively affects your ability to lose weight and can actually make it easier to get fat, not a smart diet choice. When you lack protein in your diet your body has a difficult time trying to burn off fat that is your body needs protein before burning fat. The way you prepare healthy meals drastically affect your ability to cut back on calories making diet friendly meals that actually work.